The project “Sustainable Management of Crop-based Production Systems for Raising Agricultural Productivity in Rainfed Asia” has benefited smallholder farmers by innovating resilient cropping systems, scaling up innovations and capacity building. At the annual project review meeting it was concluded that the project has shown good progress in each of its four components: (1) Designing resilient productive cropping systems, (2) Technical support and scaling out and up of innovations, (3) Inclusive market-oriented development, and (4) Building of capacity within National Agricultural Research Systems (NARS) and among farmers. 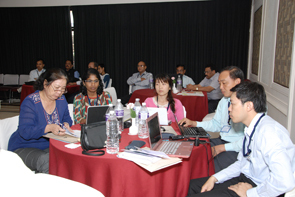 Thirty delegates from four target countries (India, Nepal, Vietnam and Lao PDR) met in Kathmandu, Nepal on 20-22 May to review the progress and map the way ahead. Dr YG Khadka, Director, Crops and Horticulture Sciences, Nepal Agricultural Research Council (NARC) welcomed the participants. Dr Pooran Gaur, Assistant Director, Grain Legumes, ICRISAT, and Project Coordinator, gave an overview of the project and the highlights of the progress made in 2013-14. He thanked the partners for effectively implementing the project activities as per approved work plans and enhancing activities on Inclusive Market-Oriented Development (IMOD) and capacity building as per recommendations of the IFAD Review Mission. The project activities are being implemented by the Jharkhand Tribal Development Society (JTDS) and Birsa Agricultural University (BAU) in Jharkhand, India; Rajmata Vijayaraje Scindia Krishi Vishwavidyalaya (RVSKVV) in Madhya Pradesh, India; State Project Management Unit of Mitigating Poverty in Western Rajasthan (MPOWER), in Rajasthan, India; Sustainable Natural Resource Management and Productivity Enhancement Project (SNRMPEP) in Laos; NARC in Nepal; and by Vietnam Academy of Agricultural Sciences (VAAS) in Vietnam. Drought forecasting and drought adaptation and mitigating strategies for the target regions are important components of the IFAD project. Sessions on Drought forecasting and ICT tools were conducted during which Drs AVR Kesava Rao and G Murali Krishna from ICRISAT made presentations on ‘Drought characterization, monitoring, and forecasting using climate data’ and ‘Remote Sensing Application in Agriculture’ respectively. To elucidate the concept of IMOD, Dr M Srinivas Rao, ICRISAT, made a brief presentation and helped participants include the IMOD strategy in the work plan. The other key participants included Drs Rajeev Varshney, Research Program Director – Grain Legumes, HD Upadhyaya, GV Ranga Rao, and S Srinivasan from ICRISAT; Dr VS Gautam, Dr PK Singh, Mr JS Mertia, and Mr Manoj Sinha from India; Dr YP Giri, Dr DB Gharti and Mr Rajendra Darai from Nepal; and Ms Nguyen Trang from Vietnam. The activity was undertaken as part of the CGIAR Research Program on Grain Legumes and the project is supported by the International Fund for Agricultural Development (IFAD).